What If Casey Anthony Had Married Her Baby Daddy? Well, this is the weirdest take on the Casey Anthony case we've seen so far: if only Caylee's dad had been around, he could have saved her from death. Very little has been said about Casey Anthony's single mom status and what could have happened or not happened if there was a father involved in little Caylee's life. I'm not even suggesting marriage here, but just a father involved enough to know that their child could be in danger. If there was a father, perhaps, he would have more information to share on what exactly transpired and more about Casey's relationship with the daughter besides home videos. [T]here is something odd about a young woman who doesn't know who the father is, or all the possible fathers are dead or in jail. What's even more disturbing is that this is more common than we think. A father can see that what grandparents can't. He doesn't have to be father of the year, but it doesn't take a rocket scientist to know when the milk has gone bad. 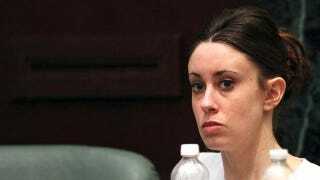 So basically if Casey Anthony was actually a murderer (I guess that's what Reid means by "the milk has gone bad") and if Caylee's dad was a reasonably nice and trustworthy guy who was involved in her life and capable of checking up regularly on Casey's parenting, then Caylee would be alive today. Possibly true, but hardly an argument for marrying one's baby daddy, the course of action Reid's site is pushing. Maybe, just maybe, a child's tragic death is not the best teachable moment for Reid's ideology.